I’ve found PrayerMate really useful in my own attempts to pray for some of these missions, and so I thought I’d write up a quick tutorial on how to use it in this way. Before we can do anything else, we need to create a card for our mission week. Tap the “+” button in the top left of the home screen. We’ll give it a name, “Mission Week”, and click the “Tap here to add details…” button as well if you want to type in a fuller description to guide your prayers. By default, PrayerMate will just show you a subject every few days, after you’ve finished praying through all of the other subjects in the same category. For our intense mission week, focus, we want to temporarily change this. 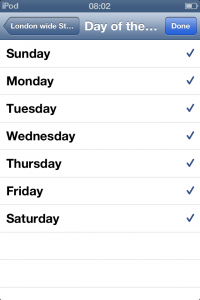 Tap the “Scheduling Mode” button, and select “Day of the Week”. When presented with a list of week days, tap each one until it is ticked. PrayerMate prioritises day-of-the-week subjects over those with a “default” scheduling mode, so this will make sure you’re almost guaranteed to see it each day from now on. 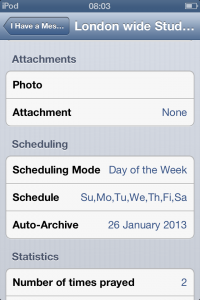 Optionally, if you want, you can specify an auto-archive date at the end of the mission week. This will tell PrayerMate to move your subject to the “archive” once that date is reached. It won’t be deleted altogether, but it will mean that this subject won’t appear any more in any new prayer sessions. Have you got a tip or trick that’s helped you to pray using PrayerMate? Send it in to prayermate at geero.net or tweet @PrayerMateApp so that it can help other people too.